The Flying Dutchman (which illustrates several of Wagner's key compositional innovations) Tannhäuser (the saga of a medieval knight torn between two worlds) Tristan and Isolde (Wagner's crowning masterpiece) And, of course, The Ring of the Nibelung (arguably the single most ambitious theater work ever created) The sheer outlandishness of Wagner's life makes for an endlessly intriguing story, from his desperate escapades outrunning creditors to his obsessive personal relationships to his utopian artistic schemes. In his writings, letters, and public actions, you investigate the often contradictory - and hypocritical - aspects of his personality. And, reflecting on the nationalist spirit of his time, you track his core desire to make "German Art in the service of a German national identity," even as he created a body of works whose communicative power transcends any national boundary. 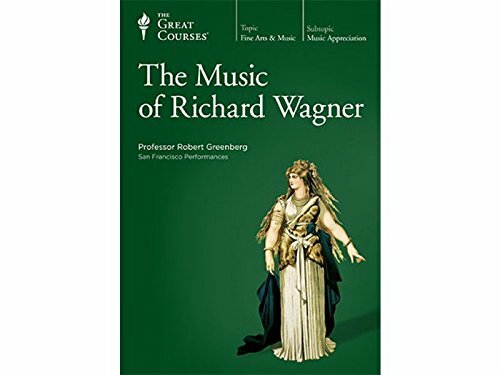 With Professor Greenberg's passionate and razor-sharp commentary, you'll plumb the fabulous mystery of a man who gave the world something of deeply compelling and universal resonance: music of great genius and a poetry that reveals the depths of the human psyche.